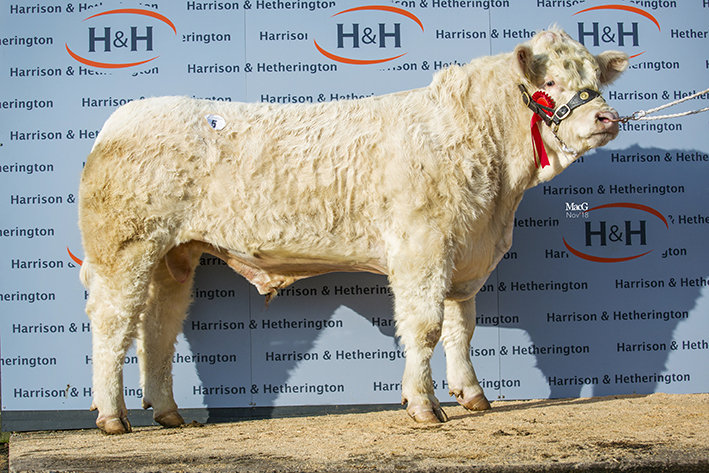 Leading the bids at 3,600gns was an entry from 27 year-old Amy Wylde and her 24 year-old sister Hannah Wylde from Woolavington, Somerset. 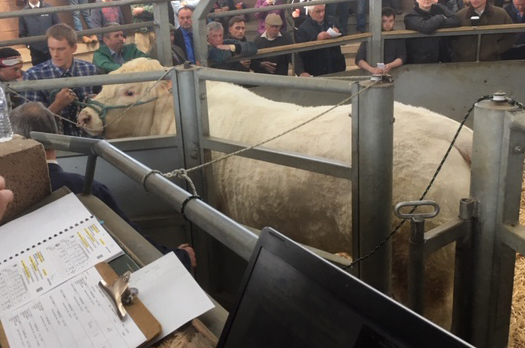 The girls who have been involved in the Charolais world since they were little with their fathers Marland herd, have only been selling their own bred cattle since last year and this is their first sale in the South West. 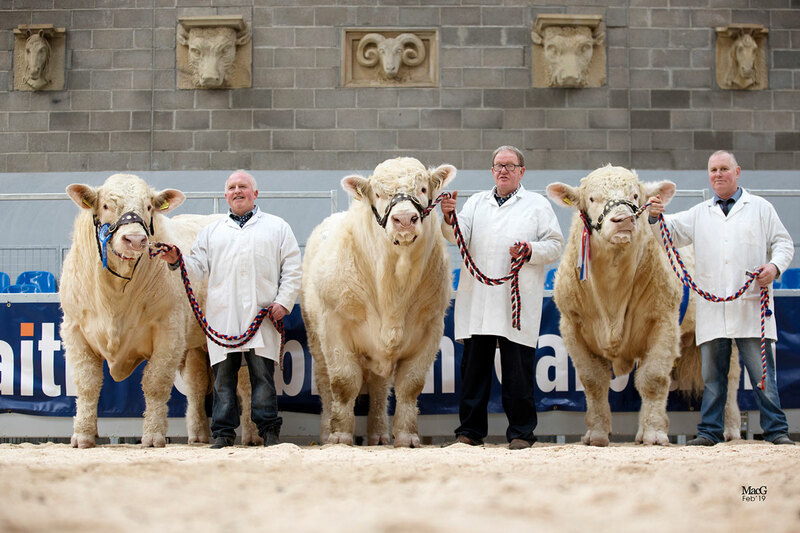 Their bull Lewyd Onslow was the youngest forward at just 14 months old. 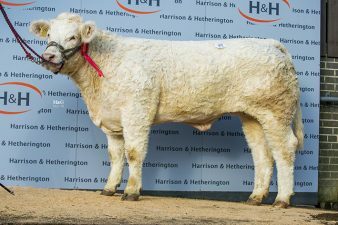 Sired by Solo Llanhilleth and out of Martland Honey who goes back to Martland Felix, he was purchased by Barry Clarke, Exeter, Devon. 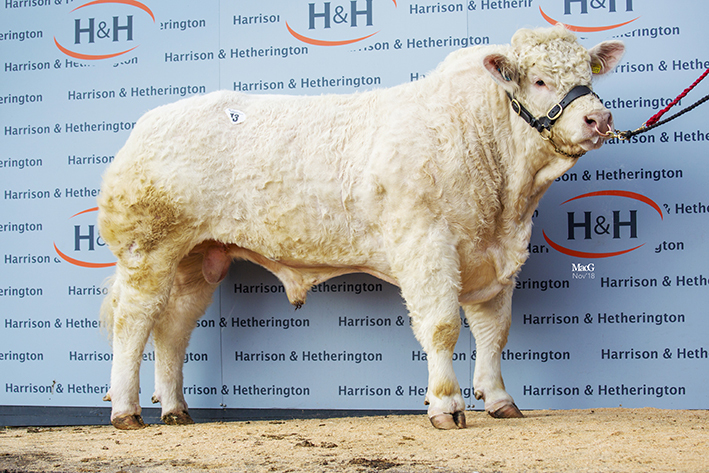 Next in the trade stakes at 3,100gns was the May 2017-born Trenestrall Nugget who caught the eye of purchaser Messrs South, Brendon, North Devon, when he was tapped out second in his class at the pre-sale show. 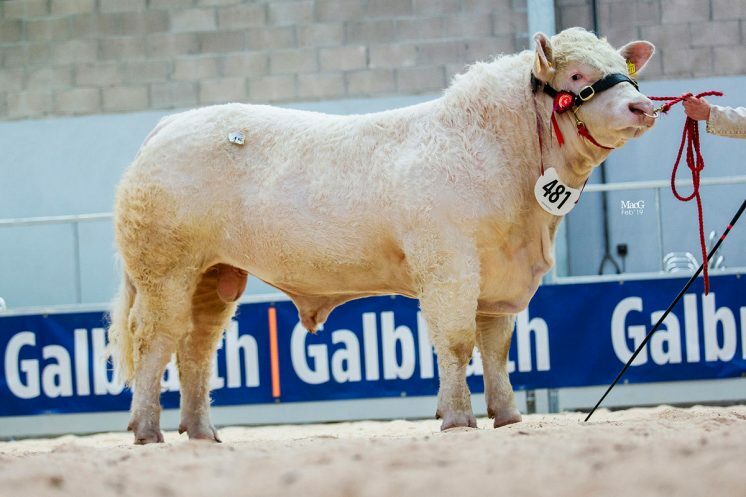 His dam is the Mortimers Cosmo daughter Trenestrall Henna and he is sired by the 8,000gns Edenhurst Idol. 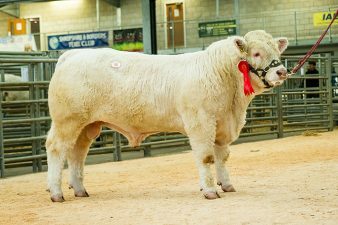 He was bred and exhibited by Will Palmer and Son, Truro, Cornwall. 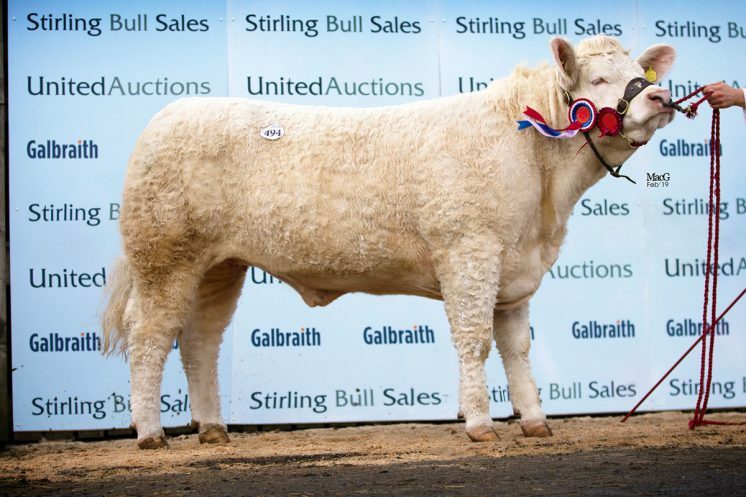 Another from the Palmer’s to find a new home was the 22 month-old Trenestrall Norush, sired by Fairway Jazz and out of Trenestrall Gush, a 7,000gns Westcarse Beef daughter, he sold to Messrs Crane, Barnstaple, Devon for 3,000gns. 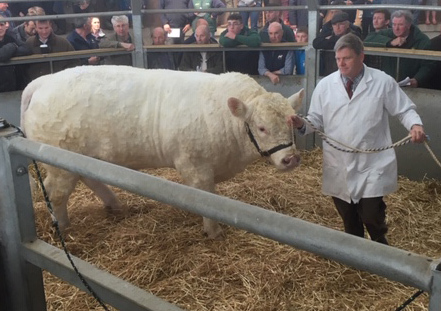 The last two bulls sold both matched the 3,000gns price tag. 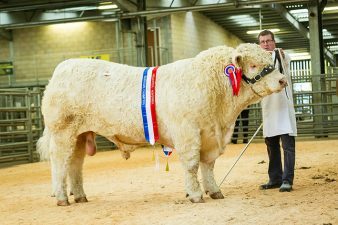 The first was Maxworthy Norris, an October 2017-born son of the 14,000gns Stirling junior champion Blelack Imperialist. 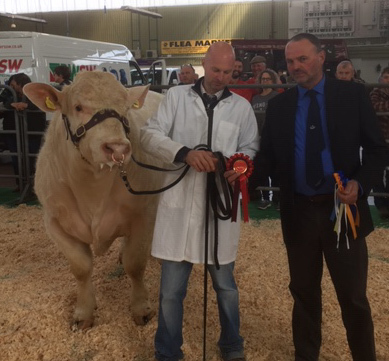 D Paul Daniel, Maxworthy, Cornwall, consigner of the red ticket winning Norris who is out of the 22,000gns Newhouse Bigal daughter Thrunton Diva, handed over the halter to new owners Messrs Hawkins, Minehead, Somerset. 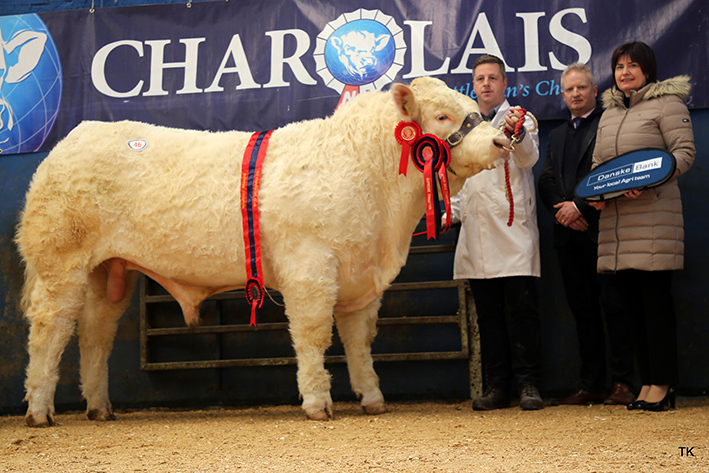 The 16 month-old Lovistone Noble was the other 3,000gns lot. This blue ticket winner who was bred and exhibited by Brian Nancekivell and Son, Okehampton, Devon, is sired by the 18,000gns Thrunton Fairfax and is out of the homebred Lovistone Lochness who goes back to Balthayock Hamish. Nobel goes on to work for JF Norman in Barnstaple, Devon. Heading up the female section was the reserve female champion Louis Imp, a Worcestershire-bred 2013-born cow consigned by Patrick Greed, Rewe, Exeter, who sold along with her eight month old heifer calf Killerton Osaka to Messrs Howard and Sons, Marsden, Wiltshire. 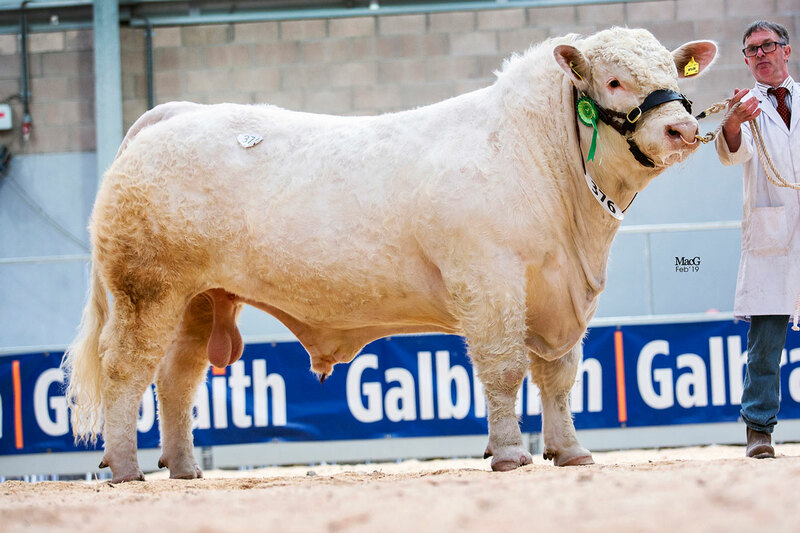 Imp is bred out of Louis Dianthus and is sired by Thrunton Fitzroy while her daughter is sired by Alwent Goldbar. 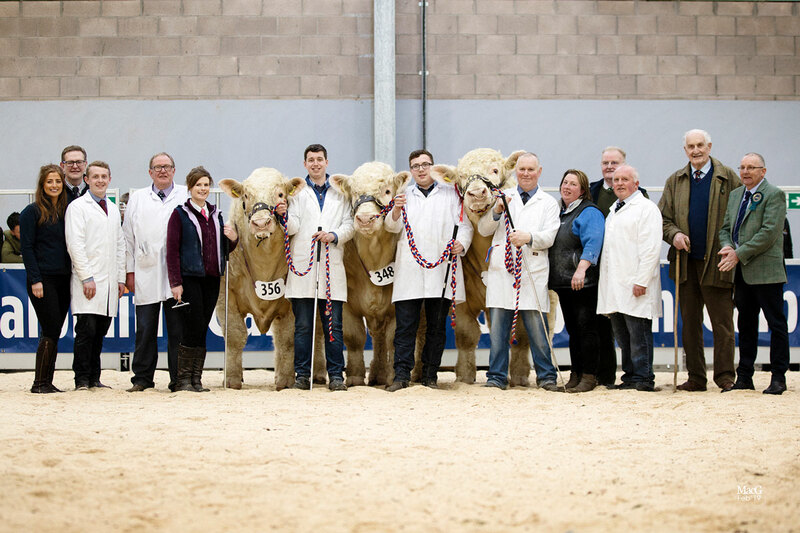 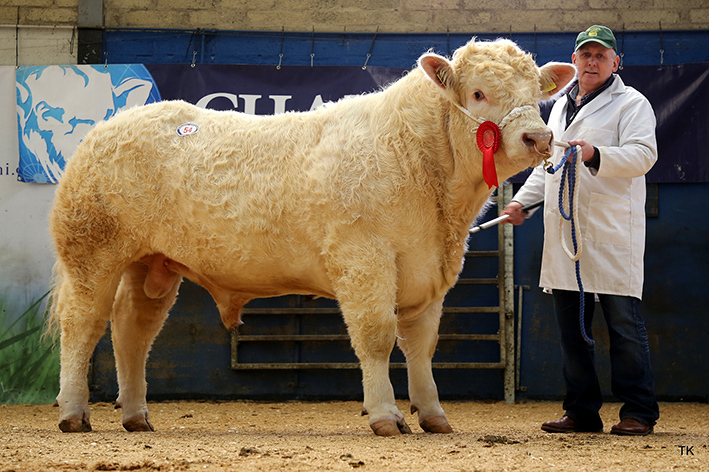 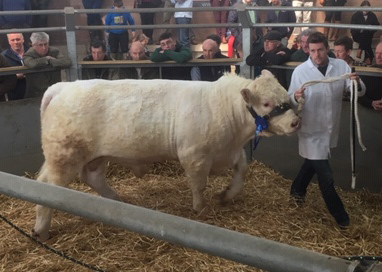 Strong commercial interest saw an increased demand for Charolais bulls at the Royal Northern Agricultural Society Spring Show on Wednesday 27 February. 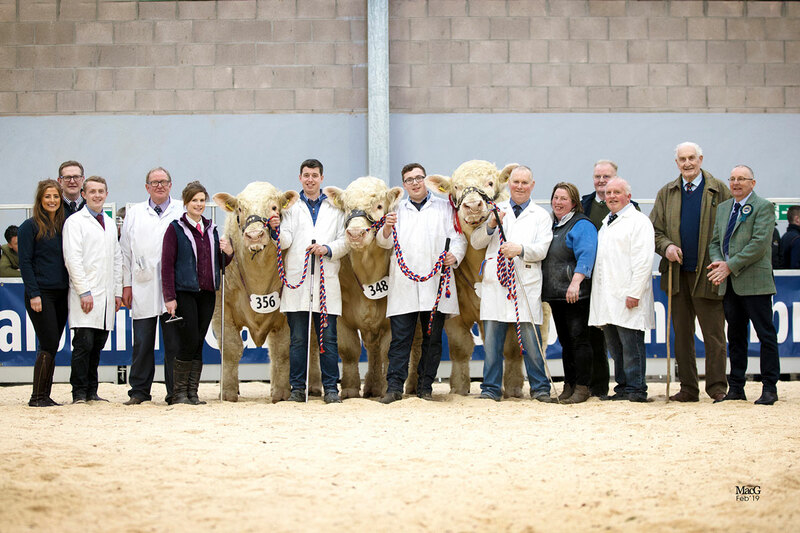 Bidding peaked at 9,500gns which was the highest price of the day across all breeds and 16 lots sold to an average of £4,463 with five more sold than last year and a clearance rate increase of 8% to 73%. Society CEO Peter Phythian, was delighted with the sale “On the back of last week’s successful sale in the Spring round of the bull sales at Stirling, where Charolais sold the most bulls, had the highest average and best clearance rate, this just goes to prove that Charolais are still in demand despite the challenging market conditions. 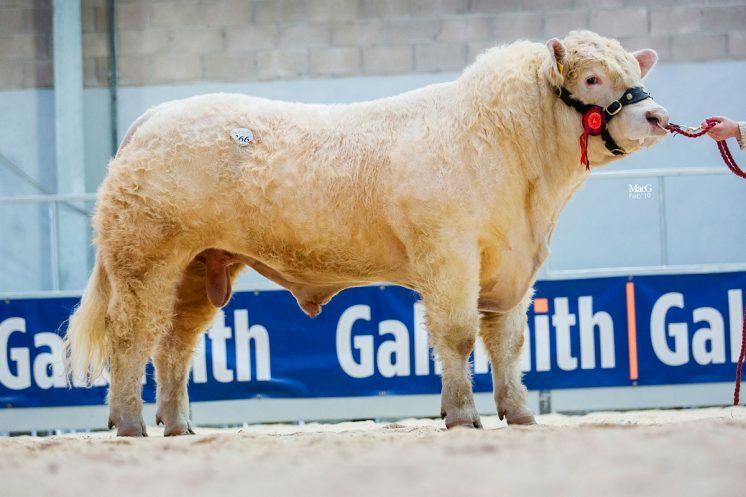 Obviously, as Charolais sired suckler calves are topping the markets on weight for age, with budgets tightened this year the suckler man wants a breed that will deliver the weights that the supermarkets demand in the shortest time, which is not only benefiting their pockets but also the environment”. The top two Charolais sellers making 9,500gns and 6,800gns respectively, both came from Robert Leggat, New Pitsligo, Aberdeenshire, who was already on a high after securing the breed and then the overall championship in the morning’s pre-sale show. 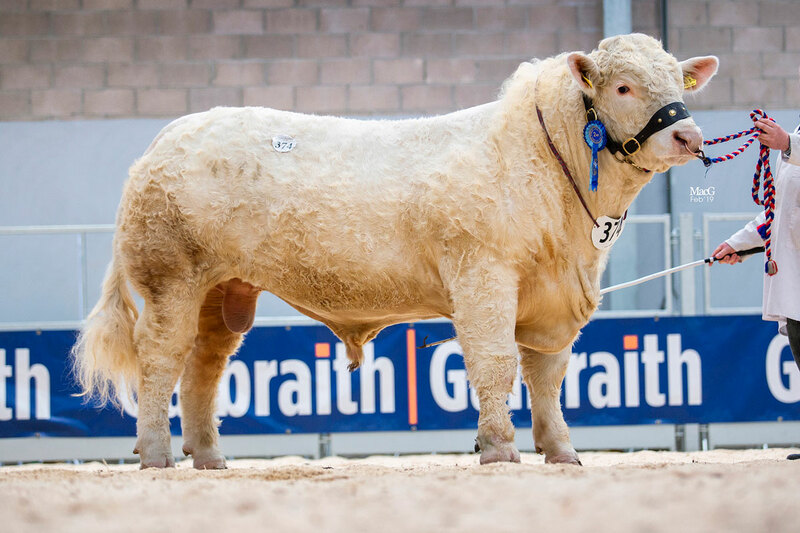 Both of the top lots were June 2017 born bulls sired by the 10,000gns Carlisle reserve intermediate champion Gretnahouse Ivory, who has bred almost 60 progeny into the Bonnykelly herd since his purchase in 2015, and both dams go back to the 9,000gns Newdeer Show champion Newhouse Challanger. 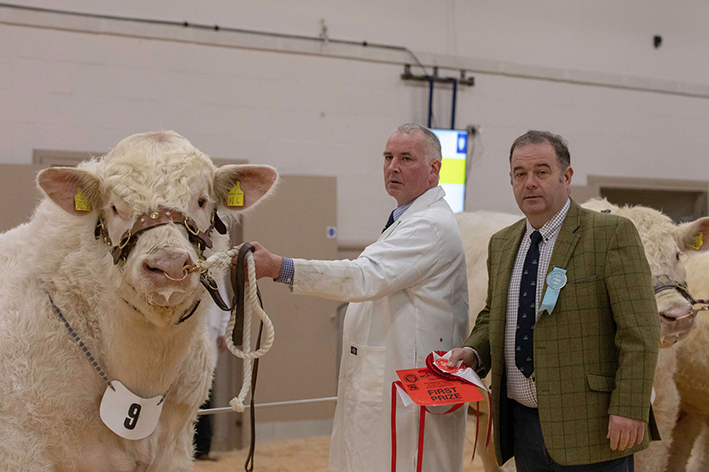 The highest priced at 9,500gns was the day’s overall champion Bonnykelly Nominator, bred out of Bonnykelly Freda, he goes on to work in Auchindoun, Banffshire, with winning bidders J and K Kellas. His shed mate Bonnykelly Nimrod who secured a price of 6,800gns from purchaser’s FJ Keir, Alford, Aberdeenshire, is out of Bonnykelly Heidi. 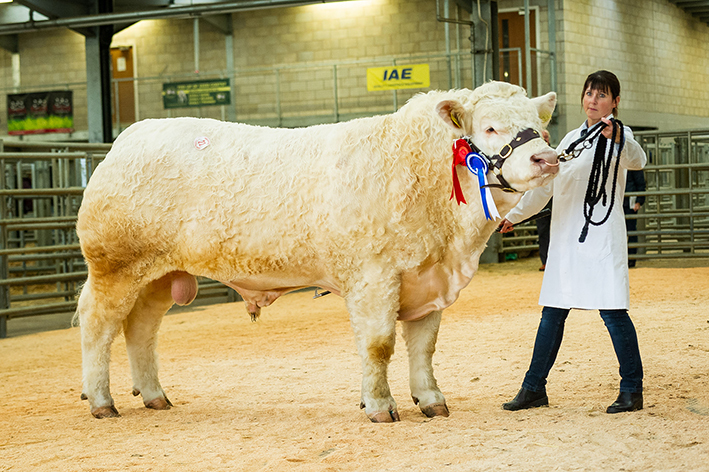 The reserve champion was next in the trade stakes at 4,800gns. Logiestate Neil, a 22 month old, who was presented for sale by AJR Farms, Ellon, Aberdeenshire, is sired by the 8,500gns Newdeer show male champion Goldies Golddust, while the dam is the 26,000gns Maerdy Amontillado-sired Craigieford Hermajest, he was purchased by M and I Steel, Banchory, Kincardinshire. 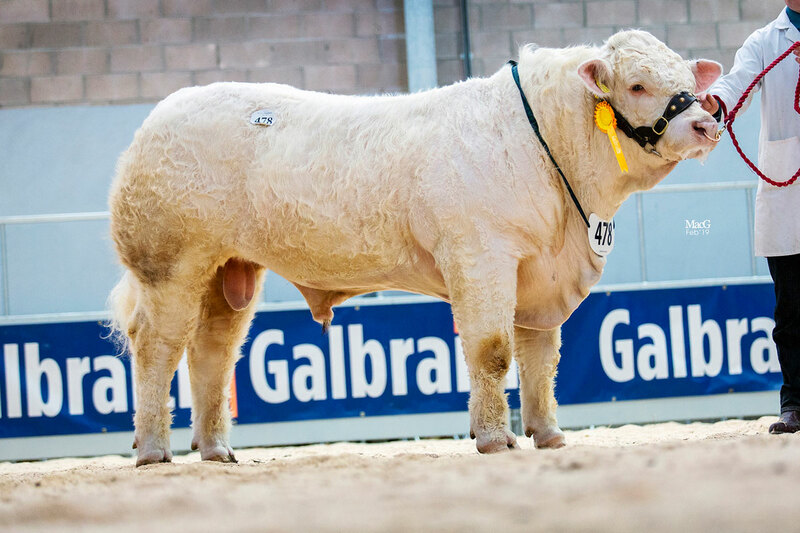 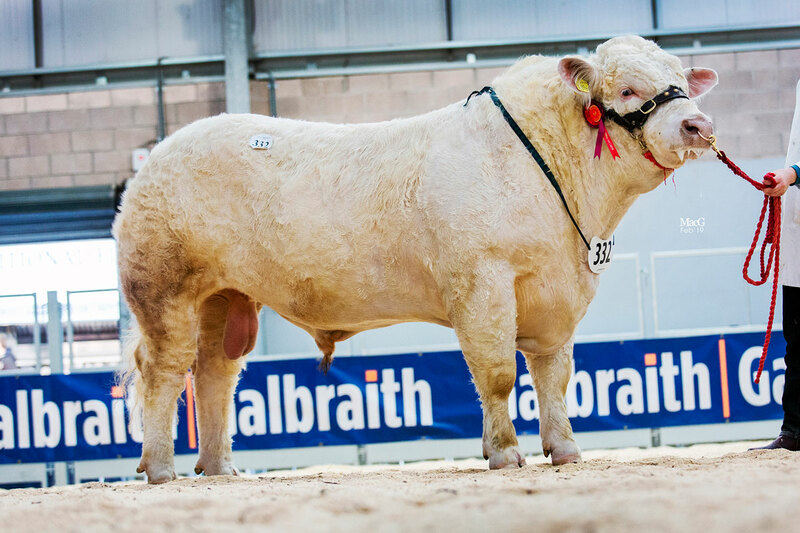 There were two 4,500gns sales, the first Elgin Navara, was purchased by JJ Gord, Wellheads, Aberdeenshire. 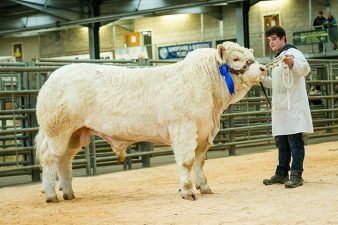 The April 2017 born Navara had been tapped out second in his class at the pre-sale show for breeders and exhibitors Roy and Matthew Milne, Kennies Hillock, Morayshire. 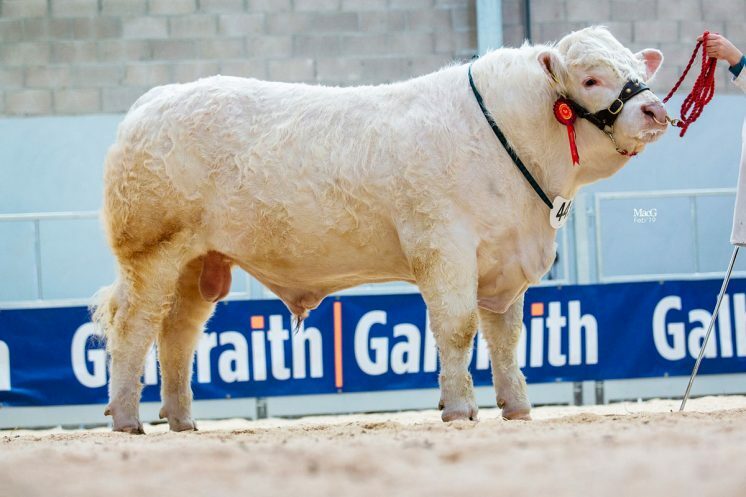 His dam Elgin Ianthe is a second calving daughter of the 12,000gns Caylers Gladiator and he is sired by the 11,000gns Woodpark Elgin, whose sons averaged 11,000gns at Stirling in October. Matching the 4,500gns price tag and this time exhibited by Andrew and James Gammie, Laurencekirk, Kincardineshire, was the 21 month old and red ticket winning Westpit Nevada. 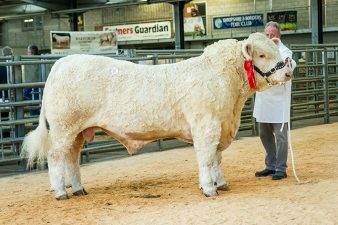 30,000gns Balmyle Bollinger is the sire here and his dam is Gretnahouse Eigg who goes back to the 18,000gns Derryharney Outstanding. He was snapped up by C Smith, Lumphanan, Kincardinshire. 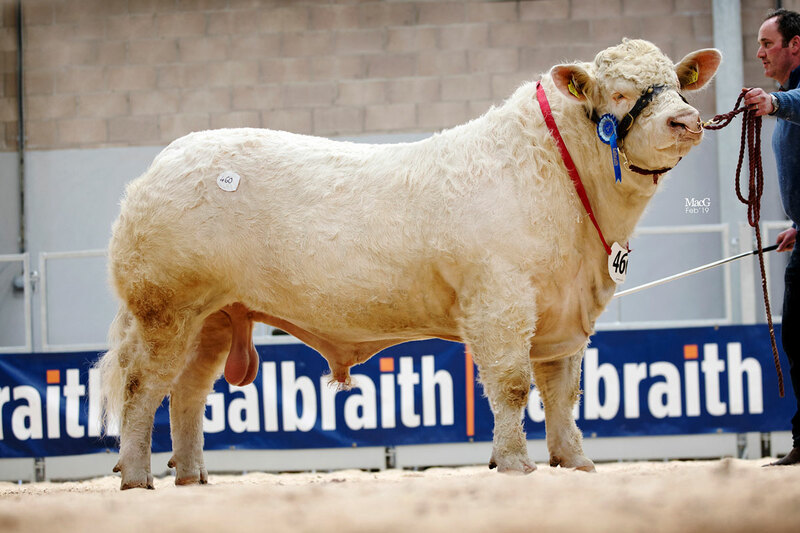 Strathys Navigator was the next highest priced at 4,400gns. A son of the 9,500gns Maerdy Harrypotter, who has bred well for exhibitor Mr K Mallarkey, adding almost 60 progeny into the Airdlin Mains, Aberdeenshire based herd. 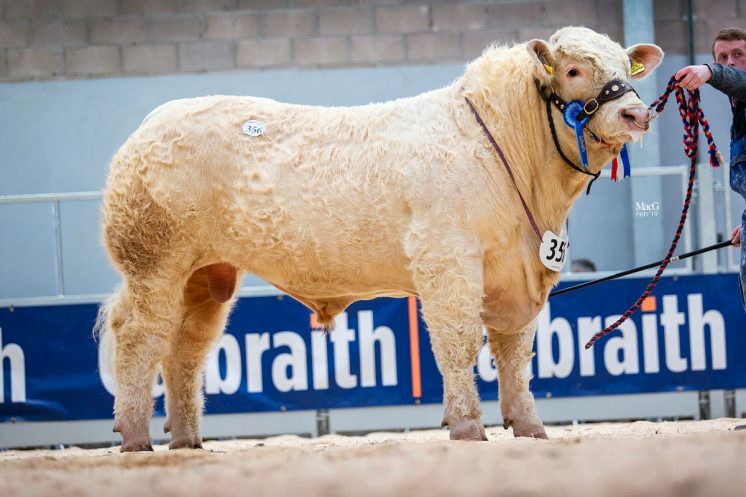 He travels on the Stenness, Orkney, with new owner WSL Muir, who took a liking to this April 2017 born lad bred out of the 12,000gns Mountjoy Eros daughter Strathys Isable. 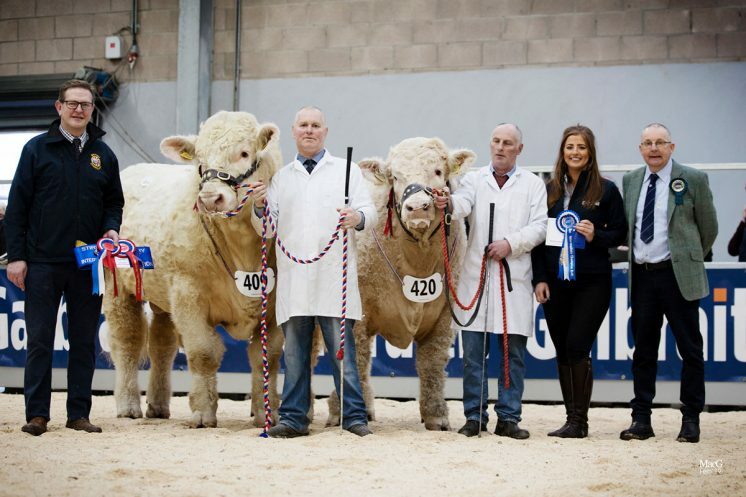 Two yellow ticket winners from John Wilson and Sons, Glenkindle, Aberdeenshire, were both knocked down at 4,000gns. Kinclune Nimrod, who was purchased by GH Sinclair, Latheron, Caithness, was the first, a 23 month old sired by the 12,000gns Stirling supreme champion Goldies Ivan and out of first time mum Kinclune Joanna who goes back to the 20,000gns Carlisle supreme champion Beechtree George. 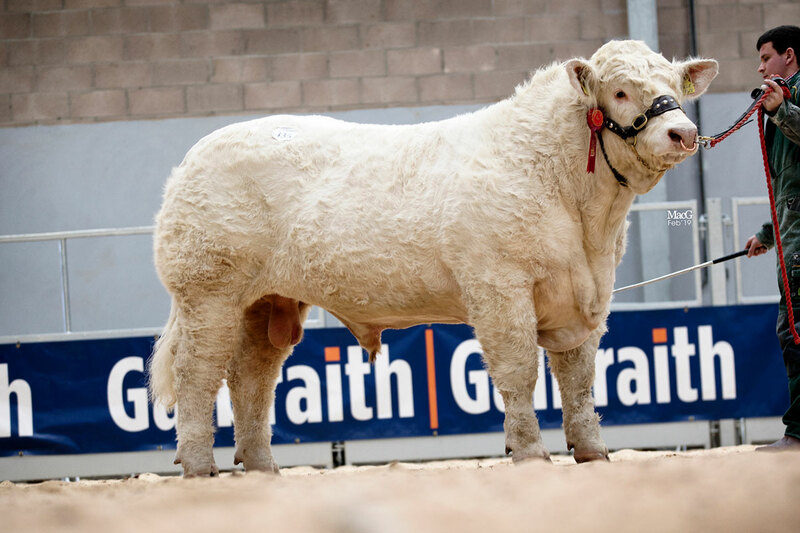 The second 4,000gns bull from the Wilson family was the 19 month old Kinclune Norman a son of the 20,000gns supreme Perth champion Thrunton Crownprince and Kinclune Ivy, who is also a Beechtree George daughter and was purchased by D Henderson, Lyth, Caithness. 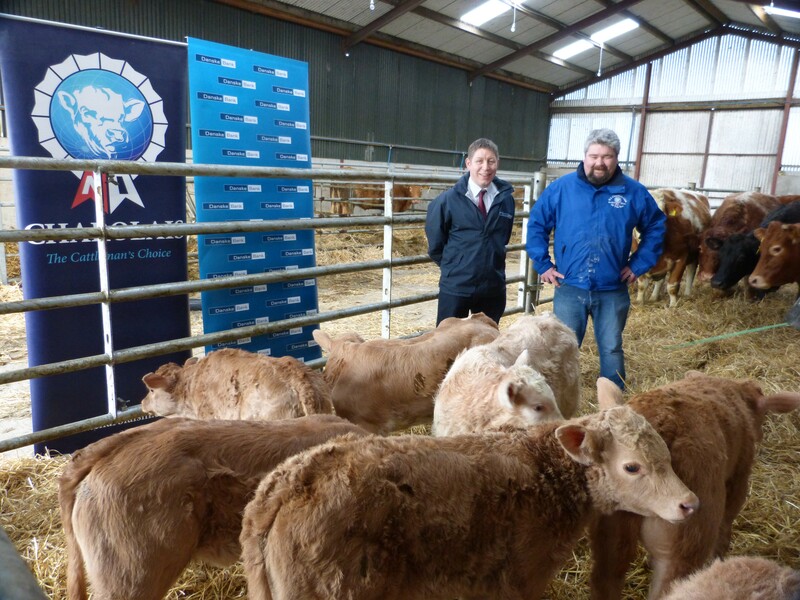 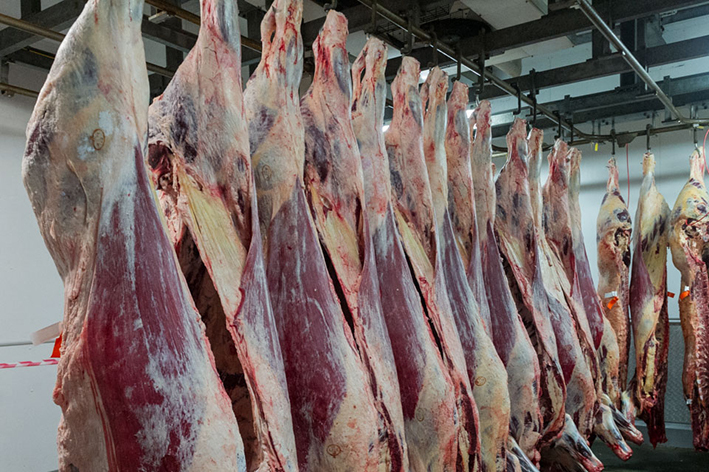 Arrangements are already well in hand for Scotland’s national beef event which will be held on an Aberdeenshire farm next year. 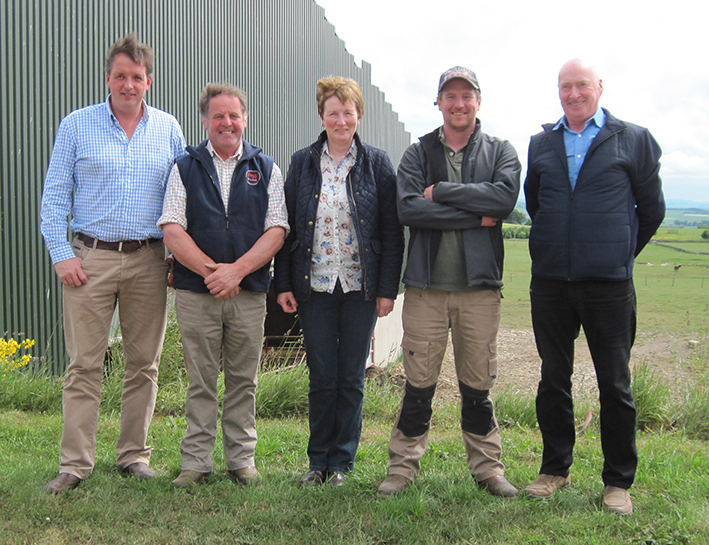 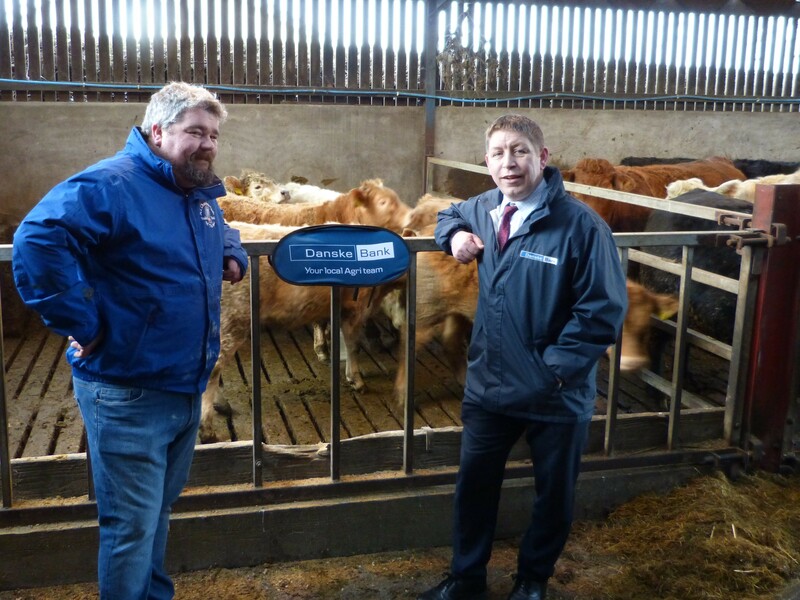 Scotland’s Beef Event 2019 on Thursday, May 30, 2019, will be hosted by beef farmers, Robbie and Barbara Milne, and their son, James, on their 500-acre all-grass farm of North Bethelnie, Oldmeldrum, Inverurie, where, with additional seasonal grazing extending to 664 acres, they run a herd of 320 Salers and Salers cross cows with Charolais bulls. 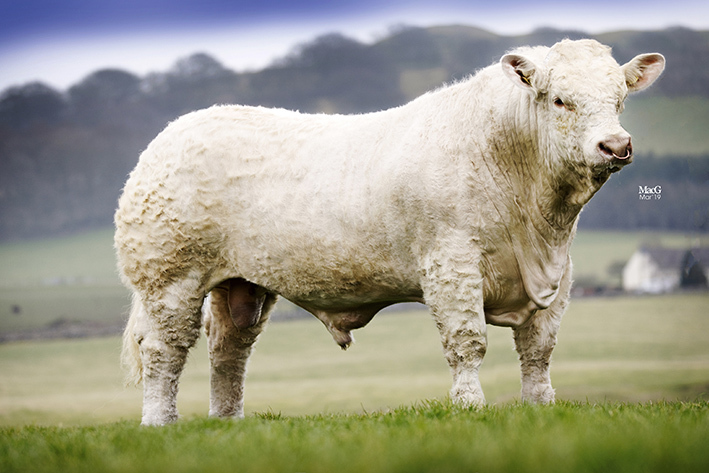 Five new Estimated Breeding Values (EBV’s) for traits that farmers are directly paid for, have been developed to help farmers improve profits by producing more beef animals that meet target specification. 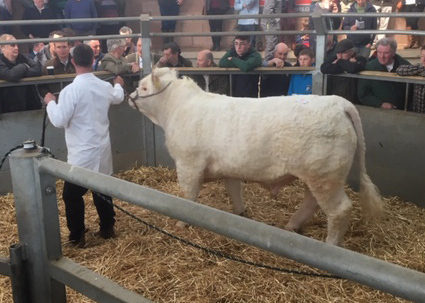 There was a strong commercial interest in Charolais bulls at Welshpool on Thursday 8 November at the breed’s official autumn sale. 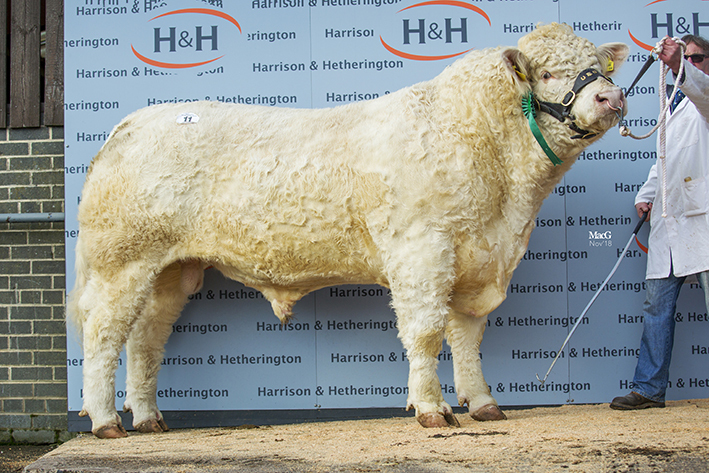 Bidding peaked at 7,000gns and 27 bulls sold to an average of £3,771, while the demand for Charolais females fuelled a 4,400gns top bid. 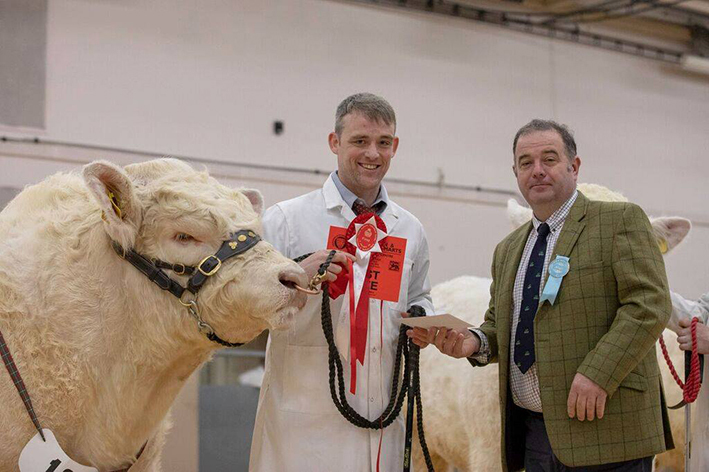 Topping the lots and securing a price of 7,000gns in a joint purchase from Society President Archie MacGregor, Kilsyth, Glasgow, and Wallace Brown, Kilmarnock, Ayrshire, was the 14-month-old Maerdy Norseman from Flintshire Vet, Esmor Evans, who had also secured the top price of 40,000gns at Stirling bull sales last month. 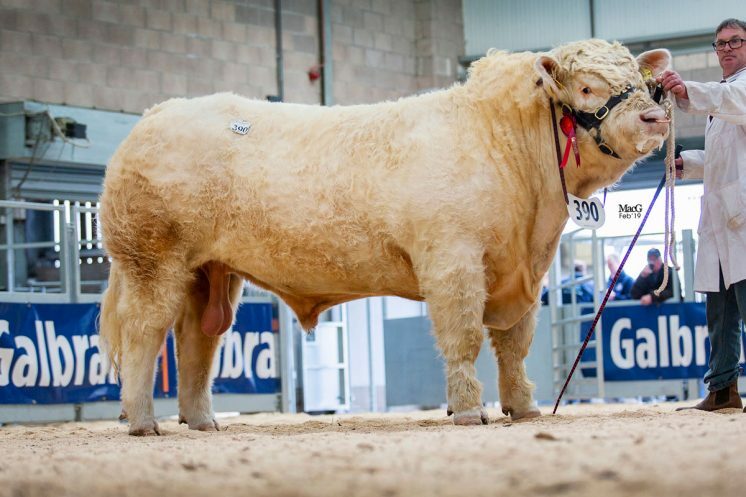 Norseman was awarded a red ticket at the pre-sale show and is sired by the 10,000gns Stirling reserve senior male champion Blelack Fabulous, while his dam Maerdy Jinny is a daughter of the easy calving and short gestation Blelack Digger. 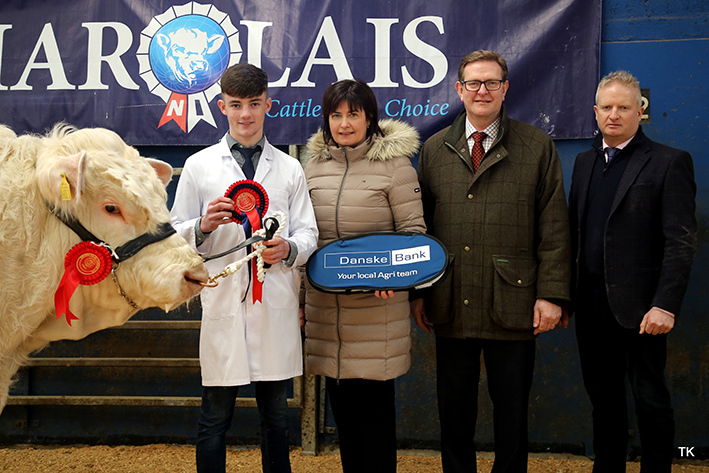 class winner Dooley Nissan. 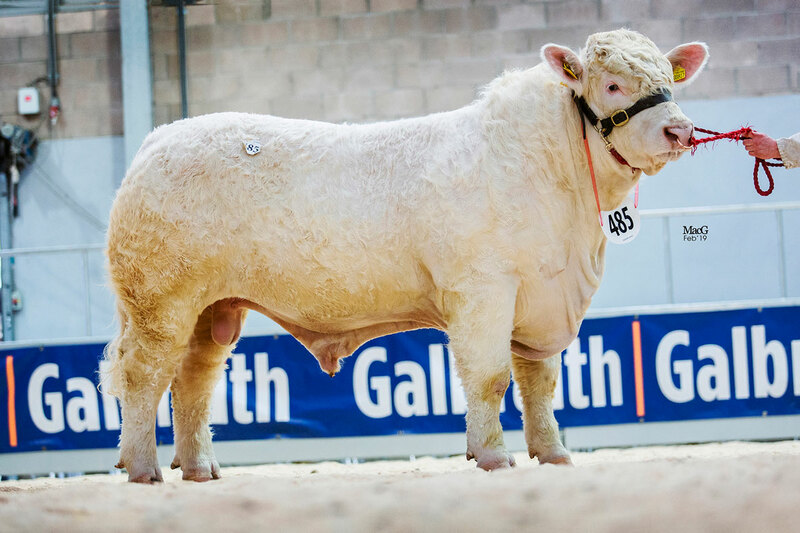 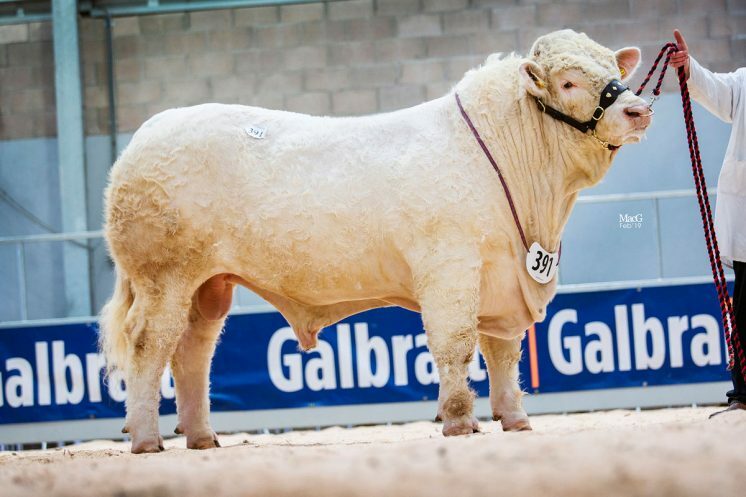 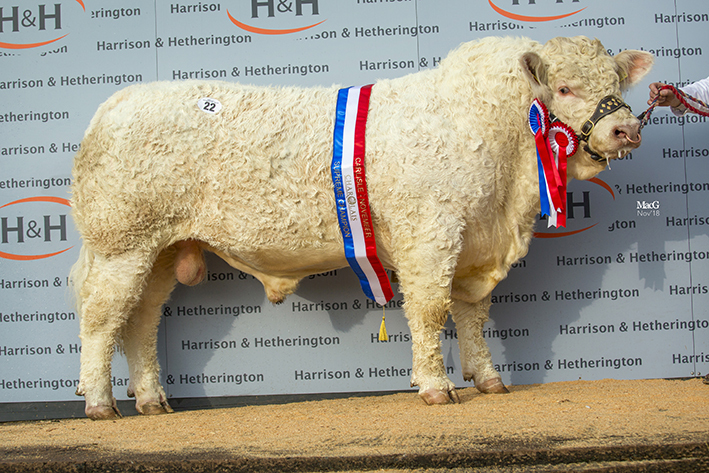 Sired by the National Charolais show supreme champion Davally Igolo and out of the Perthshire-born Harviestoun Harriet who goes back to the 15,000gns Carlisle supreme champion Burradon Talisman, he was purchased by D Morgan, Talybont, Ceredigion. 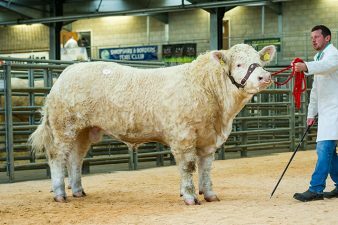 Next and selling for a 6,200gns price tag was a June 2017 born entry from Arwel Owen, Foel, Powys. 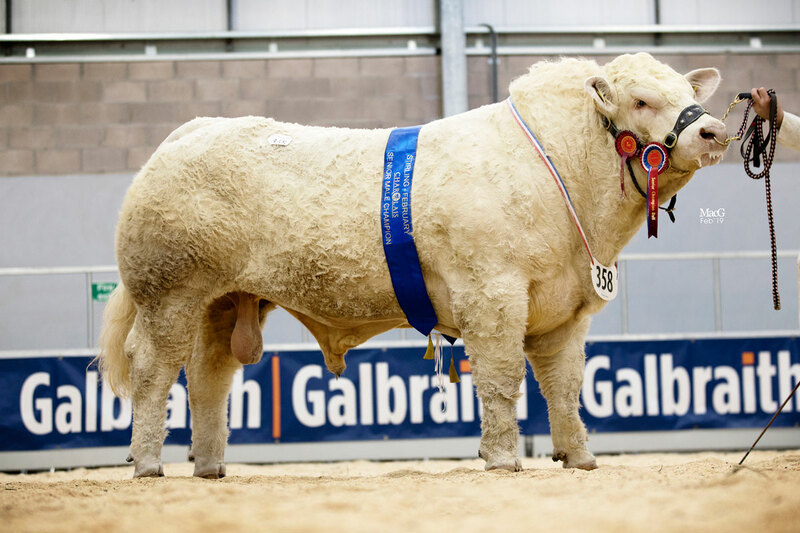 Trefaldwyn Nebo, a son of Goldies Eddy and the Blelack Digger-sired Trefaldwyn Harmony stayed local when purchased by MPB Ashton and Sons, for their Welshpool based suckler unit. 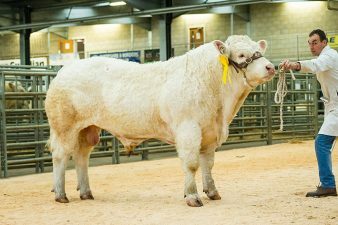 Caylers Nixon was next in the trade stakes at 5,000gns after he caught the eye of TN Lightfoot, Callington, Cornwall, when he was tapped out as reserve supreme champion by judge Emma Andrews in the pre-sale show. 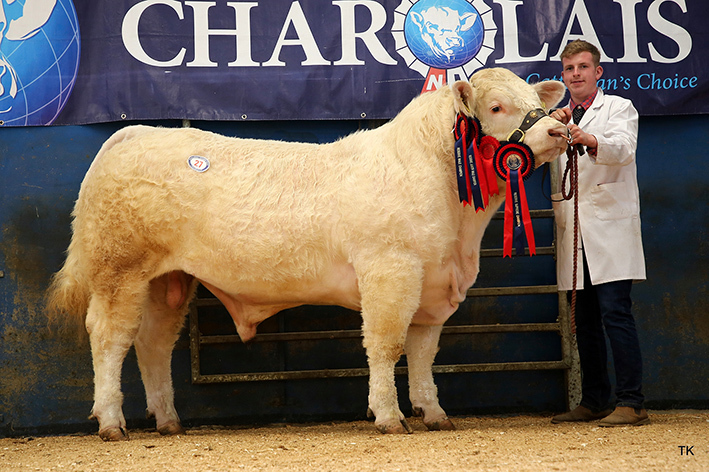 The Barker Family of Caylers Charolais, Nuthampstead, Hertfordshire, are the breeders of this 18 month old son of the Irish born Rosana Jupiter, bred out of the Thrunton Dominator daughter Caylers Graceful. Two entries from Messrs Roberts and Jones Llangadfan based Montgomery herd were the next highest priced lots and both were sired by the 8,000gns Carlisle supreme champion Gretnahouse Jugular. 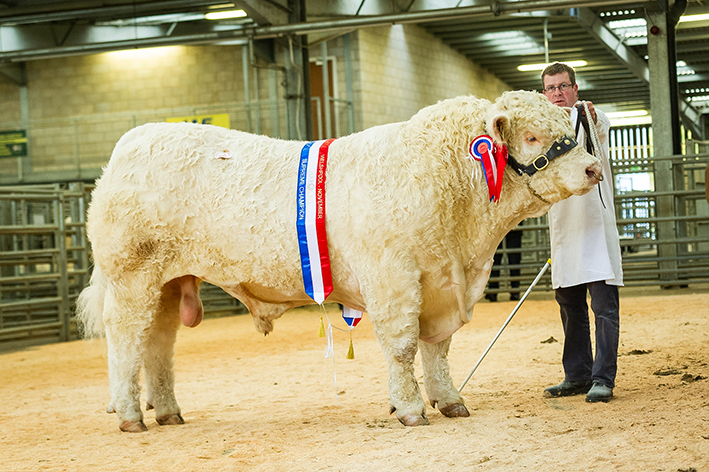 Top priced was the 15 month old Montgomery Ned who secured a bid of 4,800gns from GG Morris, Brecon, Powys. He had been handed a yellow ticket earlier in the day and is out of the Elgin Columbo-sired Montgomery Hafren. Earlier in the sale their 18 month old entry Montgomery Nefyn sold for 4,000gns. 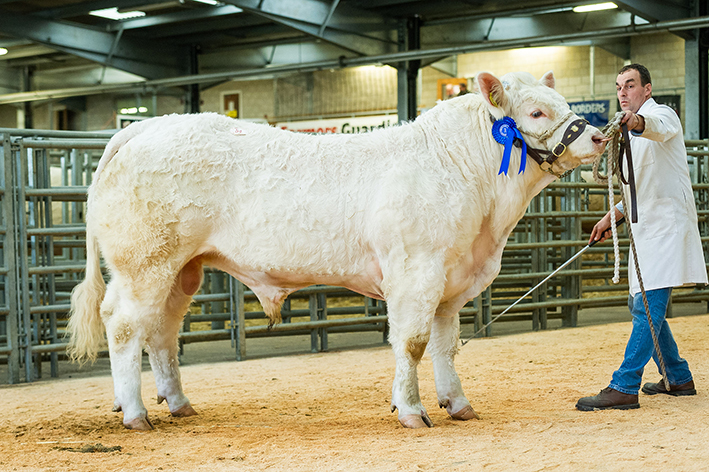 He had also been successful in the pre-sale show, being awarded third place in a strong class of intermediate’s. 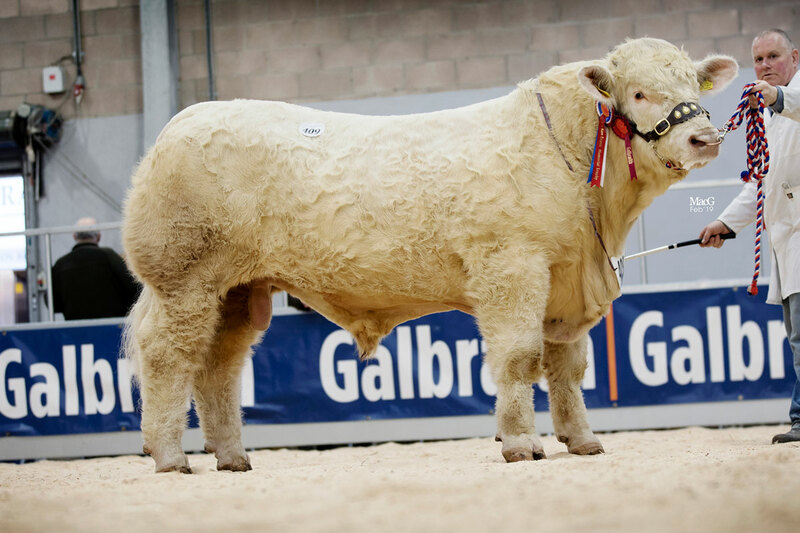 This time out of Montgomery Imperial who goes back to Blelack Digger, he was purchased by W Pugh, Rhayader, Powys. Also hitting the 4,000gns price tag was Wyn Rees and Son’s Hendy Nadal from Llangurig, Powys. 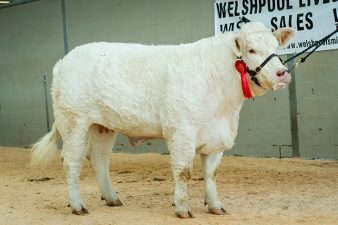 After being placed second in class, the 14 month old Nadal by Davally Illusion was knocked down to EH Anwyl, Llanbrynmair, Powys. His dam is Hendy Gentle, a daughter of the 8,500gns Killadeas Contact. 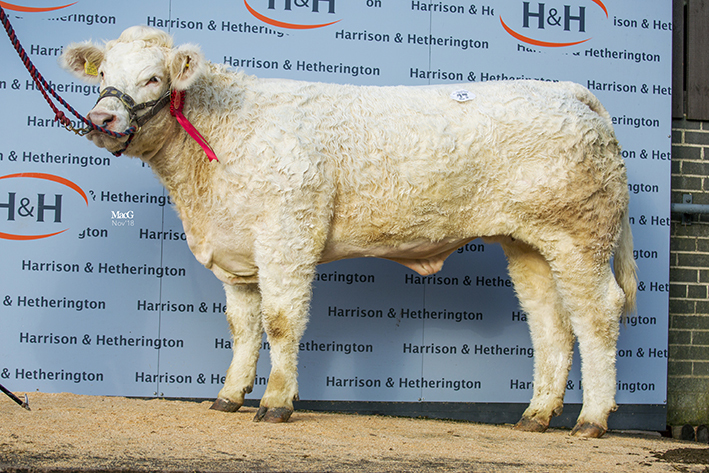 A strong entry of females saw the prices peak at 4,400gns for a class winning entry from Ann Orr-Ewing, Purton, Wiltshire. Foxacre Marcina, a July 2016 born daughter of Wesley Forceful and Moreton show reserve female champion Foxacre Flavia, was bought by Tomos Rich, Cilcain, Flintshire, who went on to purchase both of Griff Morris’ cow and calf outfits on offer. 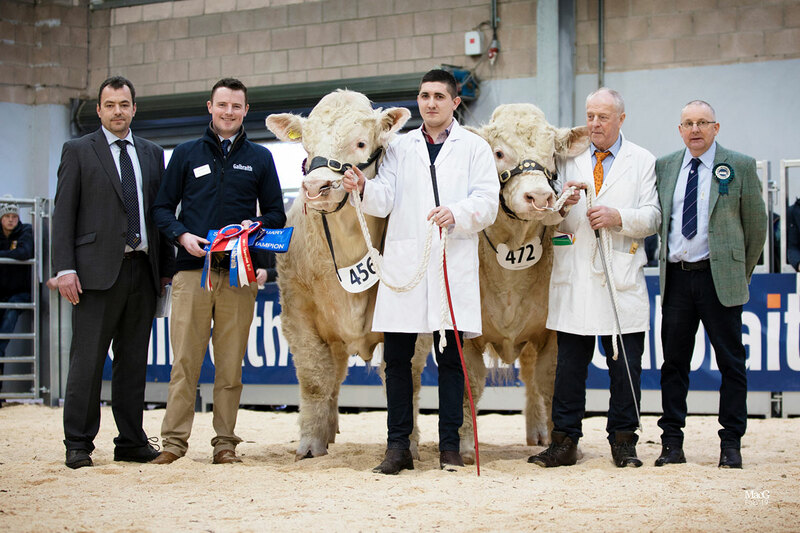 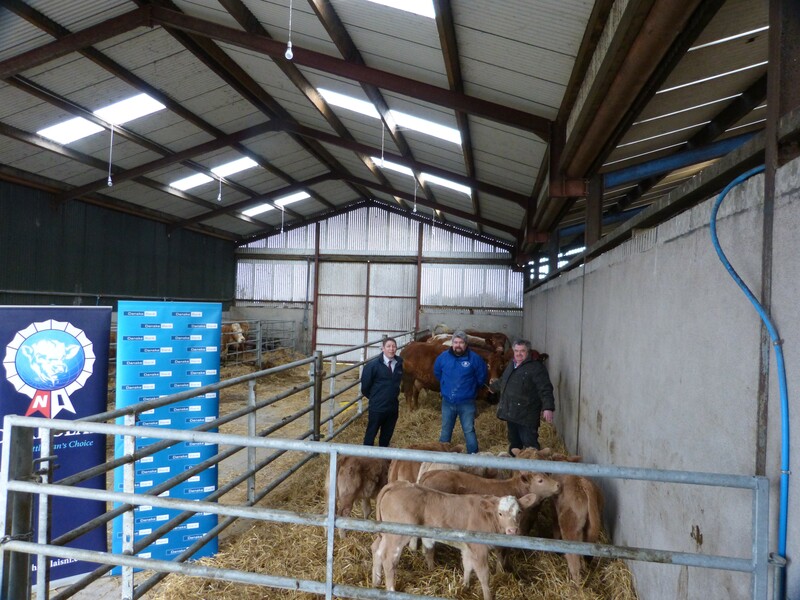 The first and top priced of Mr Morris’s cow and calf combo’s from Llanwern, Powys, secured a 4,000gns bid from Mr Rich. 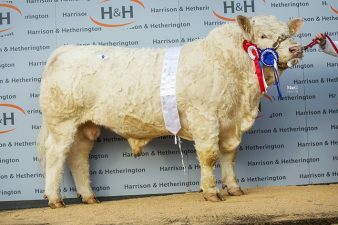 The 2012-born cow Cargriff Harmony and her seven month old heifer calf Carrgriff Octave were the pair and Harmony whose sire is the Irish-born Goldstar Echo was sold served to Thrunton Larry who is also the sire of Octave. An added feature of the sale was the dispersal of Rodney and Jake Gregory’s, Chasewater-based Kerling herd from Cornwall. 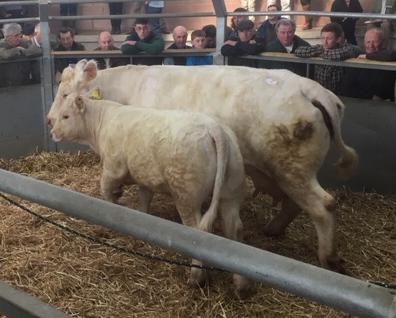 Their top lot was another mother and daughter pair. 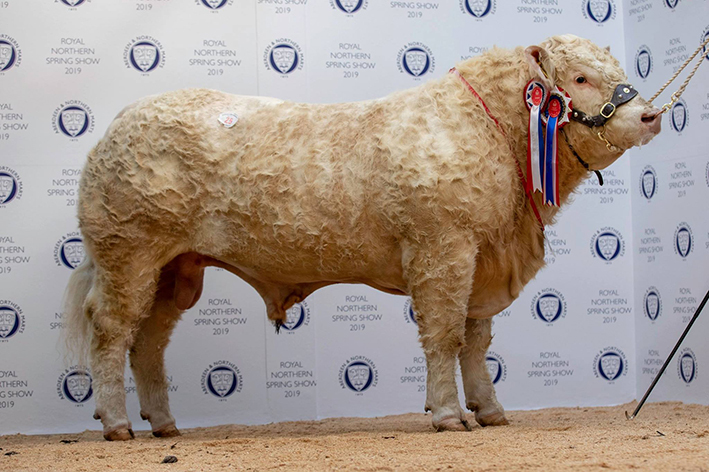 The cow Wesley Fettle, who sold served to the 9,000gns Carlisle supreme champion Sportsmans Neptune, is a 2010 born daughter of the 10,000gns Balmyle Dingle and out of the Maerdy Rock-sired Wesley Capri, while her six month old her heifer calf Kerling Octavia, is sired by Gretnahouse Loomis. 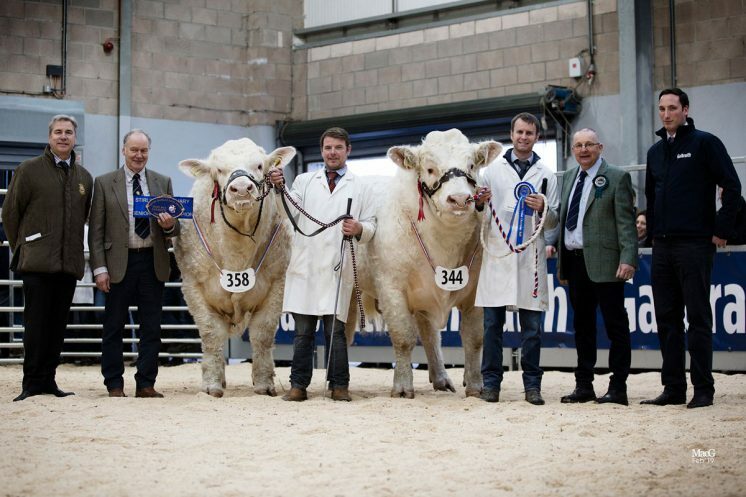 Together they commanded a 3,000gns bid from Neil Barclay, Insch Aberdeenshire. 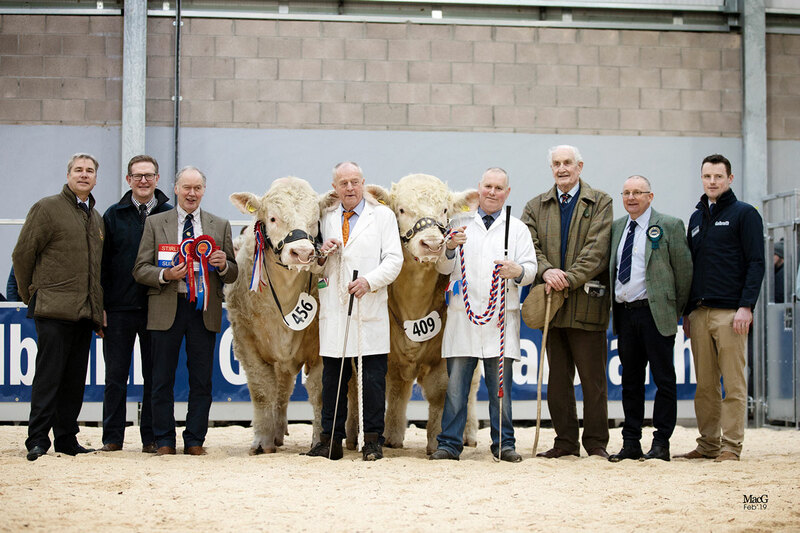 Also bolstering the female section were the production sale heifers from the aforementioned Arwel Owen’s 1994 established Trefaldwyn herd. The highest priced at 2,200gns was the March 2017 born Trefaldwyn Nova. 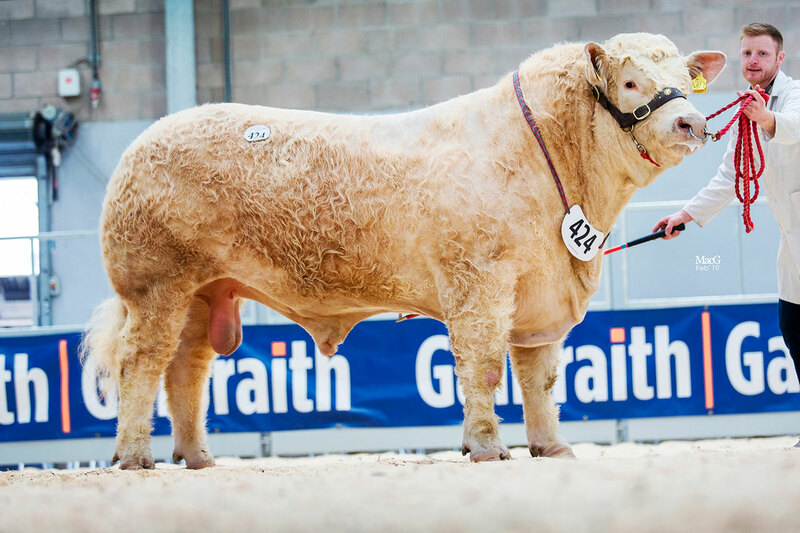 Sired by Blelack Digger and out of Trefaldwyn Jadore, a daughter of Goldies Eddy, she goes home to Talsarnau, Gwynedd, with her new owner GW Williams.